In efficient built environments, we need to ensure roofs have a clear path to the sun, in order to collect sunlight to generate power and heat water. Solar access and good insulation mutually coexist and make for a better, more efficient building. Ensuring a clear path to the sun can be controversial, especially in America where there is no “right to light.” That’s right: American law does not guarantee access to sunshine (or avoidance of shade). Recent events in California resulted in a compromise that ensures existing solar arrays have a clear, unimpeded solar access plane to the sun from 10:00 a.m – 2:00 p.m. to produce power. This “10-2” window is now an increasingly common default setting for communities looking to implement Renewable Energy Standards or solar access plane legislation (more on this in a minute). Compare this lack of American law to British Common Law, where a “right to light” has been a given for centuries, and was recently clarified with something called a Leylandii Law. Leyland cypress – Cupressus leylandii – is a popular, fast-growing evergreen plant used for screening unwanted views. But so many complaints of shading by this tree were lodged that a law was strengthened to privilege the right to receive sun over the right to screen neighbors. That is: British citizens by law cannot plant a tree where it would impede someone else’s access to the sun. Another issue we contend with in our buildings is sometimes having too much sun. A typical response—especially for residential buildings—is to plant trees to shade walls and roofs to cut envelope conditioning costs . Yet these same trees may grow into the solar access plane and decrease power generation as well as create carbon emissions from maintenance activities. For companies that lease roofing space to generate power, trees growing into the solar access plane can be a disaster for both the loan repayment and even for their business model . In the picture above, the innermost region is planted only with ornamental trees. 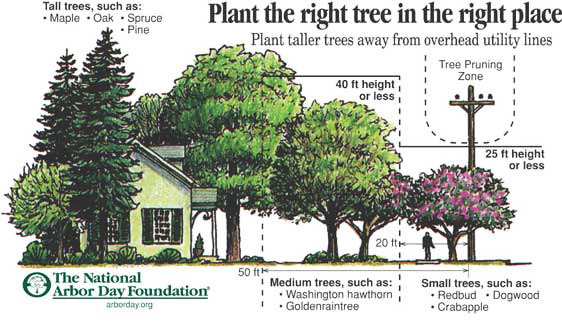 The outer regions can be planted with typical shade trees; in this rendering, a 35-foot tall tree is seen at a distance typical for treelawns in modern single-family subdivisions on the equinox at 2:00 p.m. 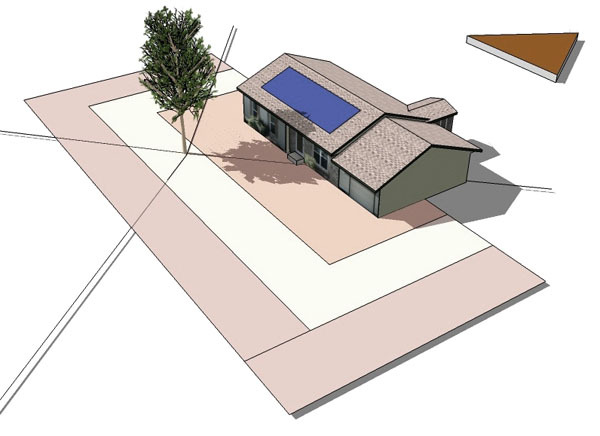 The shade tree still performs important ecosystem services; only above the tree is not shading the solar array. Similar planting zones should be implemented in the next set of LEED standards. The urban foresters are ready to help lead the way on this effort with their “solar smart practices.” Our tree canopy is too important to sacrifice for renewable, distributed energy—trees and solar energy can work together. It is true that it is likely new housing starts will be in the doldrums for some time to come, but there is still redevelopment activity, and this activity will need proper tree siting. This time, we can make a positive change before it is too late. Right tree, right place, right reason is the new paradigm. Next up: details on how to grow better green infrastructure in cities, especially parking lots and roadsides. Dan Staley is an urban planner specializing in green infrastructure on Colorado’s Front Range. Picture credits: Arbor Day Foundation, Dan Staley and John Olson. Trees can also cut heating costs slightly by creating turbulence and slowing wind speeds. This turbulence from trees and buildings is one reason why residential wind is among the least-best options for renewable energy. Several lease arrangements are currently popular, whereby a company can lease a roof for a flat fee or sell back power to the property owner in exchange for siting photovoltaic arrays. The company invests in the solar panels and labor to install and maintain, often through bank loans, and profits by the difference in savings on grid energy pricing. Good article. But trees are solar collectors too, converting radiation to food, materials and energy (fuel), though on a different timescale than other solar collectors. The other possibility is planting the tall trees much more distant from the south side of the building. In short, south facades can be as important solar collection surfaces as roves, and in fact are often superior for solar space heating. Wouldn’t it depend to some extent on the climate? In very hot climates, it seems that the shade function of trees is pretty indispensable. In those areas, it might make more sense to have block or area solar arrays that could provide electricity, while the dwelling spaces are shaded. That probably also depends on your specific design strategy. Solar panels raised slightly off the roof with insulated supports would provide good shading themselves. Cover the back of the panels with a low-e coating and you won’t even radiate much heat from the panels to the roof. This shading would occur all day long, not just when the tree’s shadow falls on the roof. Yes, some actually argue here in Colo (and I’m doing so now in a paper I’m writing for a journal) that the shade from the panels replaces the tree. I’ve also presented tree shadow work for neighborhood arrays, which IMHO do not use space as efficiently or usefully as dwelling units (DUs) or parks. Roofs are free space, unused, and dark roofs negatively contribute to the Urban Heat Island, so PV arrays are a logical choice (albeit in Colo dark roofs are used to melt snow more quickly – a benefit). Second, IBC standards for insulation are pretty good, and insulate well enough to obviate the need for trees in many places*. Retrofitting older DUs to walls of R-25 and roofs of R-35 would eliminate any need for trees. The strawbale buildings I have been in (and helped build) have zero need for trees for shade, due to their superior insulation. Last, solar gain is indeed an issue always, in all projects, when trees are involved. If you are going to do passive solar you must take great care in your tree selection. My argument above does not consider solar gain as this is an entirely different animal – but I will make it explicit in my paper with a couple – three sentences and thank you Doug K for mentioning it. *AIUI, and someone can correct me, IBC standards are close enough to LEED standards that some places can skip the certification and extra cost to get to silver (as did the city in WA where I used to practice, when they designed their new firehouse). Solar panels contribute to the heat island effect and do not cool by evapotranspiration as trees do in addition to shading. My speaking engagements in 2009 and some in 2010 addressed these issues with respect to designing the compact built environment to keep trees, including coming back to Seattle to speak on these issues at the New Partners in Smart Growth conf there. Here is a paper I wrote on this topic in the context of the Urban Heat Island. The paper I’m working on now (where this essay came from) addresses these issues in the context of context-sensitive street design and parking lot design, among other things. Nonetheless, the proposal here is simply to re-think the current tree planting paradigm, not to eliminate trees. Thanks!